I know, I know, it’s far too early for me to be jibber jabbering about Christmas. I proffer no excuses and can only beg your forgiveness at such an imposition. This year I done 2 designs which are totally handmade and painted. (limited to 20 of each) The series is called ‘Pets Love Christmas’. You can order them here. I have also hand painted some black and white printed cards I did last year. You can order them here. I will be at the Fairy Tale Fair in Brighton Race course on Saturday 6th December between 10am and 4 pm where I’ll be selling cards and handmade original art work. Find out more. I have plenty of Original Art available to buy online if you can’t make it. Check it out here. Anything ordered from me before 12th December will reach you before Christmas. 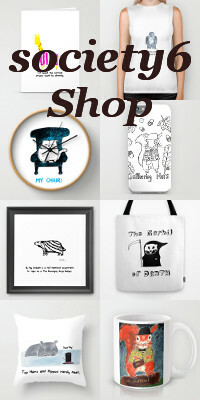 Additionally peruse my Society6 shop for Prints, Pillows, Christmas Cards, mugs, iphone case and much more. I have been chosen to exhibit some of my work online for the Blog and Buy Christmas Sale. Go take a look. Society6 are doing it again!